While birds are able to naturally perceive the Earth's magnetic field and use it for orientation, humans have so far not come close to replicate this feat - at least, until now. Researchers at the Helmholtz-Zentrum Dresden-Rossendorf (HZDR) in Germany have developed an electronic skin (e-skin) with magnetosensitive capabilities, sensitive enough to detect and digitize body motion in the Earth's magnetic field. As this e-skin is extremely thin and malleable, it can easily be affixed to human skin to create a bionic analog of a compass. This might not only help people with orientation issues, but also facilitate interaction with objects in virtual and augmented reality. 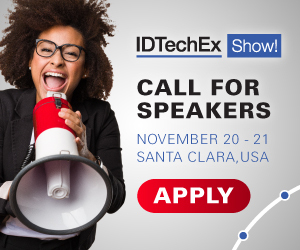 For more information see the IDTechEx reports on E-Textiles 2018-2028 and Augmented, Mixed and Virtual Reality 2017-2027. Just swipe your hand to the left and the virtual panda on the screen will start making its way towards the bottom left. Swipe your hand to the right and you can make the black-and-white animal face the opposite direction. This demonstration is reminiscent of the famous scene from the movie Minority Report where lead actor Tom Cruise controls a computer with nothing but hand gestures. What was science fiction 16 years ago, has now become reality thanks to Dr. Denys Makarov and his team of HZDR researchers. Neither bulky gloves, cumbersome glasses, nor sophisticated camera systems are required to control the panda's path. All it takes is a sliver of polymer foil, no more than a thousandth of a millimeter thick, attached to a finger - and the Earth's magnetic field. "The foil is equipped with magnetic field sensors that can pick up geomagnetic fields," says the lead author Gilbert Santiago Cañón Bermúdez. "We are talking about 40 to 60 microtesla - that is 1,000 times weaker than a magnetic field of a typical fridge magnet." This is the first demonstration of highly compliant electronic skins capable of controlling virtual objects relying on the interaction with geomagnetic fields. The previous demonstrations still required the use of an external permanent magnet: "Our sensors enable the wearer to continuously ascertain his orientation with respect to the earth's magnetic field. Therefore, if he or the body part hosting the sensor changes orientation, the sensor captures the motion, which is then transferred and digitized to operate in the virtual world." With a sensor attached to his index finger, the user started out from the north, first heading west, then south and back again - causing the voltage to rise and fall again accordingly. The cardinal directions that were displayed matched those shown on a traditional compass used as a reference. "This shows that we were able to develop the first soft and ultrathin portable sensor which can reproduce the functionality of a conventional compass and prospectively grant artificial magnetoception to humans," Bermúdez says. But that is not all. The researchers were also able to transfer the principle to virtual reality, using their magnetic sensors to control a digital panda in the computer game engine, Panda3D.